Source: the Mail, October 31, 1891. For the sheer variety of acts, few venues in town could top the Musee theatre. From its opening as Robinson’s Musee in late 1890, the combination of theatre, lecture hall, and dime museum at 91 and 93 Yonge Street offered up a rotating roster of sideshow and vaudeville acts. To see all that is to be seen, one must go to the Musee to see the many features presented by Manager Moore for his patrons. Sampson, a man billed as the strongest man on earth, will appear, displaying his herculean strength by breaking solid bars of iron, snapping in twain welded chains, and other feats that will astonish his audience. A band of Hottentots brought to this country recently by Dr. Stone, the missionary, will enlighten people as to their native customs. Zamossa [sic] the Zulu, who participated in the late Zulu war, will also be present. 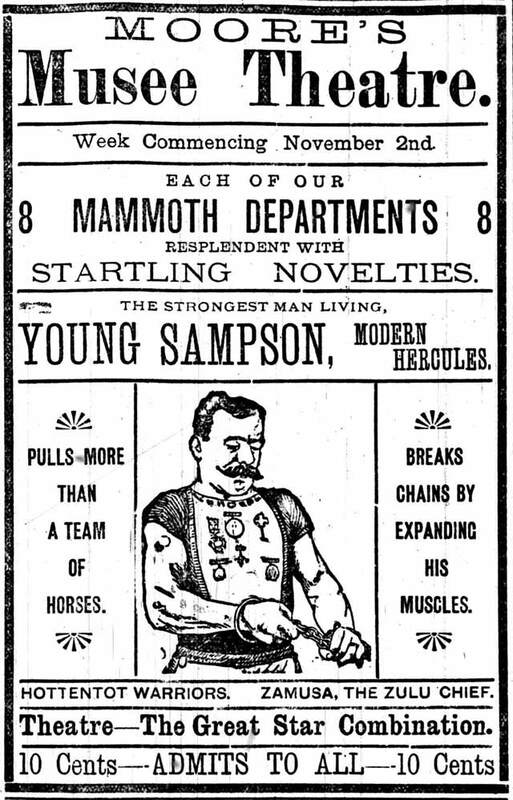 Comparing the drawing used in this ad with other 19th century strongman posters, the “Modern Hercules” in question was likely Charles Sampson. Many of his claims about his abilities were highly suspect, including a boast that he acquired his talent for bending iron after being struck by lightning as a teenager in France. He often rigged his performances by using tactics such as emptying backstage the sand or lead that filled his barbell, while his manager dramatically outlined to the crowd the “feat” they were about to see. His “feats” faltered in the face of less shady early bodybuilders, such as the time he was humiliated in a strength contest with Eugen Sandow in London in 1889. While Sampson was exposed as a fraud in front of audiences whenever the rigged methods he used to perform tasks like lifting an elephant with a harness flopped, he remained a popular vaudeville attraction during the 1890s. The Musee passed through several owners during its existence. During the summer of 1891, original proprietor Marion Robinson passed the premises to James Moore, who promptly renovated the facilities. After changing hands at least one more time, Robinson reassumed control in 1896. He offered one piece of programming starting that August which merited the plaque found on the office building currently occupying the site: the first presentation of projected motion pictures in Toronto. Additional material from the November 2, 1891, November 3, 1891, and November 4, 1891 editions of the Mail.